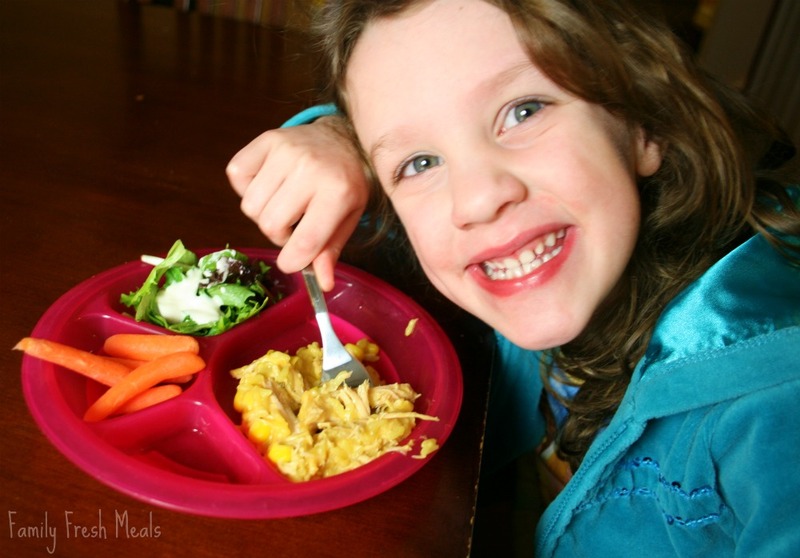 Need a basic recipe in your arsenal that will make “happy plates”? 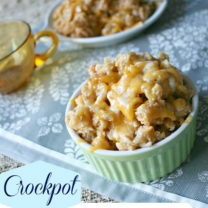 There is one word to describe this crockpot meal…. ADDICTING! 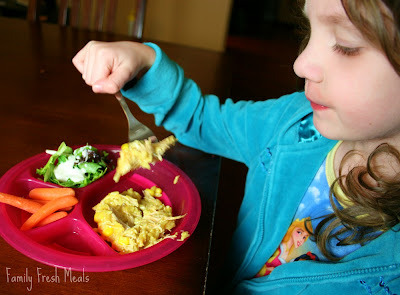 The zest from the Zatarain rice, blended with the sweet corn and creamy cheese is AWESOME! The girls loved it and asked for it again the next day. To add a twist to the leftovers, I sauted some baby spinach and then mixed in a serving of the Cheesy Chicken and Rice. It added some green (which I love) and another dimension to the flavors. 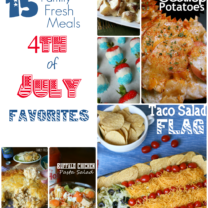 Hope you enjoy this easy family favorite! 1. 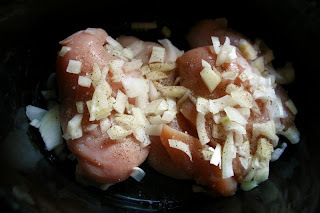 Place chicken into crockpot and season with salt and pepper.Sprinkle your chopped onions on top of chicken. 2. 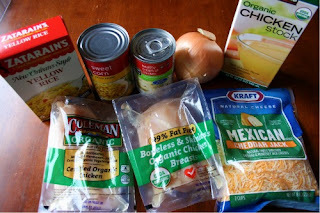 Mix together the chicken broth and can of cream of chicken soup. 3. 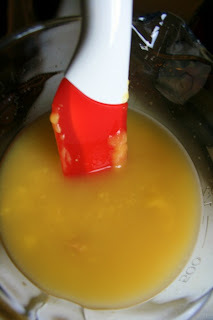 Pour mixture over chicken. 4. Cover and cook on LOW for 7-8 hours or HIGH for 4 hours. 5. Right before serving, shred chicken with 2 forks. 6. Add in cooked & prepared Zatarain’s rice, cheese and corn. 7. Mix well, until cheese is melted. 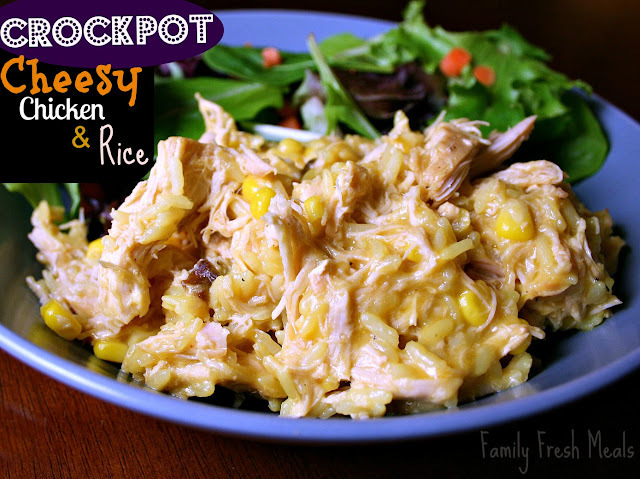 There is one word to describe this Crockpot Cheesy Chicken & Rice .... ADDICTING! 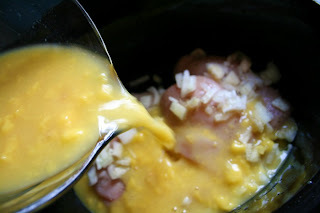 The zest from the Zatarain rice, blended with the sweet corn and creamy cheese is AWESOME! The girls loved it and asked for it again the next day. 1 (8oz) box Zatarain's Yellow Rice, cooked according to package. Add in cooked & prepared Zatarain's rice, cheese and corn. I tried this with a boxed gluten free cream of chicken soup (Pacific is the brand) and it came out wonderfully! We made it and thought it was delicious!! Hi there. I know this recipe is old but hoping someone will answer! What size crock pot will this fit into. We have a smaller sized one. I like to use a 5-6qt crockpot for this recipe. Hey, this was delicious and a big hit. Even my wife got seconds which NEVER happens. Thank you. This sounds great! I love quick crockpot meals! Hello! Love your blog everything looks so yummy! Just a quick question for you though,…I’ve never heard of Zatarain rice and its definitely not sold anywhere around where I live. Can you tell me what it is so maybe I could find a substitution please? I doubt we could get this in Australia either. I am not sure we have any type of yellow rice. Could you possibly tell us what the ingredients on the box are, and we can try to find a substitute. – thanks. Love your recipes – they are awesome. It was a little watery, but was a family hit. 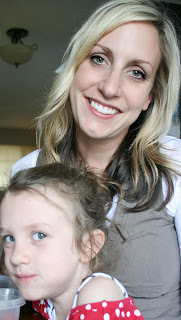 I just love your Kid Tester, she is adorable! We are going to just love this dish with the Zatarain Rice to really give it a nice kick of spice and to have it in the Crock Pot, oh yes, I love it! Hope you are having a fabulous week end and thank you so much for sharing with Full Plate Thursday. You were featured on The Sweet Spot! Be sure to come by, grab a button, and link up your newest recipes to this week’s Recipe Party! Yummy and easy!! Thanks so much for sharing! Yum! I ended up making this in my oven, but still wonderfully delicious. Thank you! How did you make in the oven? Any idea about the poundage on the chicken breasts? We buy some organic ground chicken and wonder if that could be substituted. Alternatively, since I don’t cook meat that often, I’m wondering how well the chicken shreds or does it end up more like big chunks? Just curious! Thanks for all the wonderful recipes and ideas! I would guess an average chicken breast weights about 3/4 to 1 lb. The chicken shreds super well… it looks just like pulled pork consistency when you take 2 forks to it.I am sure the ground chicken would taste just as good, but would just have a different consistency. I hope that helps. Looks great! 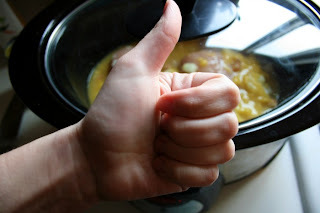 Have you ever tried adding the rice to the crockpot after the chicken’s almost done? Im wondering if it would cook alright and that way I don’t have to use another pot. I have never tried it that way. Let me know how it turns out if you do! 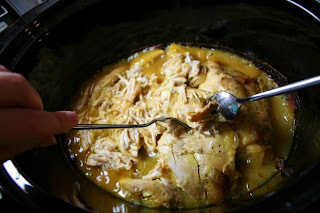 I am making this now, how much liquid should be left in the crock pot after the chicken is cooked? It seems like I have a lot. Should I take some out? Kristen, I didn’t take any out. Look over the directions again to make sure you did all the correct measurements. I know it might look like a lot, but when you add in the rice cheese and corn at the end, it all thickens up. Hope that helps! I read the instructions several times and also had quite a bit of liquid left. I just drained it.. wonder why though? Did you put a can of water in with the cream of chicken? I was unsure wether or not to do this? That has been corrected, sorry Vicky. Hey Corey, we just had this for dinner and I have a 5 year old girl 2 and 1 year old boys. The two oldest said that they were not going to eat it because it didn’t look good to them. I made them taste it and all three of them LOVED it. They had a ton of it. Thanks for a great recipe! I made this tonight & it was really. really good 🙂 Thank you! Thank you so much for stopping by to let me know! I am so glad it turned out for you! Jennifer, I really don’t off hand, but there are a ton of sites out there that you can quickly input the recipe items and can tell you. I love the one on My Fitness Pal… and it is free! This is finishing up in the crockpot now. The test bite before the garlic bread is done got “oh my god this is amazing” from my hubby! So easy and yummy to boot. Thanks for the great recipe. I know this post was over 4 years ago, but I went to the store and got chicken STOCK, following the ingredients list, and then saw in the instructions to add chicken BROTH. I had some on hand so I used the broth, but am now bummed because it looks like I should’ve used the stock I planned on in the beginning! 🙁 Can you please confirm which one I should’ve used? Also, I only have rice pilaf, not yellow rice. Do you think this will work? Thanks in advance. Hope it’ll turn out ok!! Hi Gretchen! I have used both stock and broth. A subtle taste difference, but not much. I have only made this recipe with the listed yellow rice, so i can’t say how well rice pilaf will work. Sorry! Any cooked rice will work, just a difference in flavor but not consistency. Zatarain’s is too spicy for me, so I used a Spanish rice mix; tasted great! my almost 2 year old son loves this crockpot meal!!!! thanks! Looks yummy. Have you ever used this as a freezer recipe? I am thinking that the rice would get mushy…perhaps I could add the rice after it thaws? Did you ever try the freezer option? I’m looking for meals for my sister that I can freeze then she can thaw to cook in crockpot for ease. Did the rice get mushy? For the yellow rice, Saffron is the key ingredient in The Zatarains rice mix. I live in Louisiana and buy this rice a lot!! Never thought about using it like this recipe says though and can’t wait to give it a try!! I accidently made it too salty with onion salt (the whole thing dumped instead of the shaker). It was still good. I actually only had white rice on hand so made yellow rice with turmeric. That was my first stab at that and it came out really good. My husband is lactose intolerant and still ate it knowing his pain come the following day. Will be making again. I replace it with that doesn’t come in a can or jar or package? Also, I’m assuming making this grain free would be fine? Sorry to be a pain! Just need some recipes to make chicken semi edible. We hate, hate, HATE chicken, but as it’s relatively inexpensive, we tend to eat it at least three times a week. Hoping to be able to make this. I’m thinking possibly just using a heavy cream in place of the soup? And taking out the corn? I’ll make my own rice and stock, and I think that that would fix it up? That sounds like a plan 🙂 Can you do cream cheese? No, he’s lactose intolerant. Which really is not cool I love cream cheese. I used cream of celery (ran out of cream of chicken soup) and I added black bean, boom they were so good! Thank you for sharing this recipe. Cooking this today…. I’m guessing its quite good for leftovers? The recipe makes a lot so As long as reheated well? I plan on cooking this today! I can’t find Zatarain’s rice at any stores around where I live. Can I substitute brown rice? If so, what seasonings do you suggest I add in the absence of the seasoned rice? I have only made this with Zatarain’s rice. Sorry! Any sort of Mexican rice would also work. If you cannot find that and only have brown rice, maybe use some salsa and cumin. I hope that helps! cAN I COOK EVERYONE ALL TOGETHER ONE TIME ??? Hi! I was wondering if you’ve ever tried freezing the leftovers? We only need about 3-4 servings but it would nice to have an extra meal already made in the freezer. Thanks! the corn just didn’t sound good but frozen peas are the magic touch! 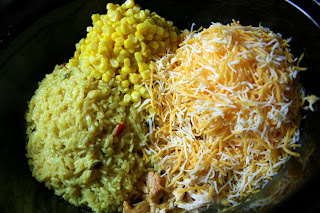 i love that yellow rice so of course it would make any dish yummy! not big on white meat either so thighs work really well. i just wanted to find a recipe for creamy, cheesy chicken that i could make my own. with a little tweeking, this rocks! Sounds like a yummy plan to me! I am sure it will be great! Made this for dinner today! It was delicious! Carolina rice makes rice with Saffron and without the MSG. My family was crazy about this dish and I made a little extra rice for another dinner tomorrow. I recommend this dish highly! Thank you for this comment – there was no Zatarain’s Yellow Rice at my grocery store so I’m using Carolina – nice to know about the MSG. Can’t wait to try this! It sounds so good! One quick dumb question- do you cook the corn first or does it heat in the crock pot? Thanks for the new recipe. Instead of corn, I added frozen broccoli florets about 30 minutes before I was ready to serve. I really liked it. We are serious cheese lovers, so I think when I make it again I might try using cheddar cheese soup instead of cream of chicken. Other than that two thumbs up. Oh heck yes! Just straight up delish! Best crackpot recipe of yours yet! (& I’ve made a ton of yours so far). There was so many leftovers too, even though we all ate a lot, which is just plain awesome. I will add lots more veggies next time. Made this a few weeks ago and my girl and I loved it. Could you use frozen chicken breasts or do you think they need to be thawed first? My rule of thumb for crock pot chicken is to thaw first. You can use frozen chicken but the thawing may make the recipe slightly watery and of course the cooking will take longer. I made this over the weekend, but with a twist! 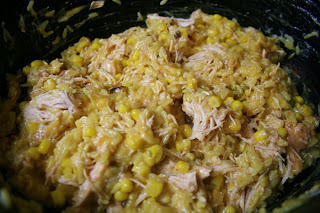 After the chicken was cooked, I removed it from the juices in the crock pot to shred and mix in cheese, rice and corn. Then, I put the mixture in tortillas and rolled them up and placed them in a baking dish. Next, pour the juices from the crock pot over the tortillas, sprinkle some cheese on top and bake for 10-15 min on 350 or until the cheese is melted. 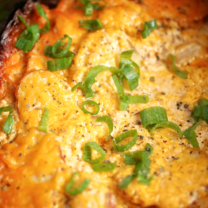 Serve with salsa and fat free cream cheese and you have cheesy chicken enchiladas. Saw a couple other people ask this but there were no replies. Do you think this would freeze ok after its done?? I was wondering how you would go about popping this in the oven? This seems like a fantastic meal! We made this for dinner tonight. It is so good, my kids are asking for more! I don’t know if there is a difference between stock and broth, but I used chicken broth and it was runny. I added some cream of celery to it and took the excess juice out to make the rice. Everything turned out perfect! Thanks for posting this delicious recipe and for making my life easier with all of your crock pot meals. The ingredients call for 2 cups of chicken stock, yet the instructions says mix in the chicken broth. Which is it? Can i mix in all of the ingredients at once before i go to bed? Or do i absolutely HAVE to wait until almost serving time to add the rice, corn, and cheese? (I can wait to add the cheese, but i wanna add the rice and corn now, if its not gonna ruin it) Im trying to be domesticated since my boyfriend and i moved in together lol but i dont wanna ruin the meal because i was inpatient…. thanks! I would wait Jessica. The other ingredients will over cook. I made this last week and it turned out great! So flavorful. Thank you for sharing. Yay! Thanks so much for the super sweet comment Roxana! could i use onion flakes instead of onion. i don’t want to have to deal with the onion. also how long before i serve do i add the rice, corn and cheese? i am cooking at my house to take to my friends. can i add it before i leave my house? I’m cooking this right now! It smells really good! I didn’t dice the onions but left them in strands. Waiting to be able to shed the chicken and give everything a try! I’ll let you know how it turns out! I hope you love it Mallory!! Oh my gosh! This is sooooo good! My two year old is loving it as well! Probably because it has cheese and rice in it. Thank you for this simple yet delicious recipe! Adding this to my favorites! Yum! I am soooo looking forward to making this but I had a question…. What size crockpot did you use? I have an 8 qt crock pot and I have had to double or even triple the ingredients to fill it enough to cook properly. Making this recipe as I type. I did however find the same rice at my local Walmart where they have rice o’roni. I live in Washington state also, I’m seeing a lot of people not being able to find the same rice used in the recipe. Excited to taste this.